This sauce is used with the fish tacos as well as the Mexican-style grilled corn. I also use it as a dip for chips as well as a condiment when I’m serving tacos, burritos and fajitas. 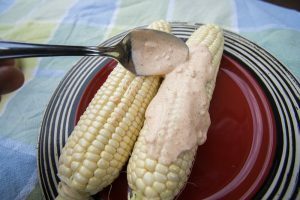 Mix together the mayonnaise and sour cream, or mayonnaise and yogurt, or all three. Add the lemon and lime juice and mix until well combined. Add the chopped garlic, chili powder and salt. Mix well. Add the Tapatio and mix. Taste and adjust salt and lime juice until the sauce reaches the desired taste. Applying the secret sauce to the corn before it goes on the grill.